I did my undergraduate studies at California Baptist University where I earned by Bachelors of Science degree in Kinesiology. While at CBU, I was on the swim team. I earned 28 All-American honors, I was a 6 time individual NAIA National Champion, 7 time NAIA National Champion relay member, I was awarded the Outstanding Swimmer Award my junior year, and I was a team captain of 2 Men's Swimming and Diving NAIA National Champion teams. Chiropractic played a large part in my success as a collegiate athlete and guided my decision to become a chiropractor. I wanted to improve the performance of athletes through a safe, healthy, and natural way. To do this I attended and ultimately graduated from Palmer College of Chiropractic-West Campus, focusing on preventing sports injuries as well as improving sports performance. While in chiropractic school I was a part of the largest student run sports council. As a member of the Palmer West sports council I got the opportunity to treat amateur and professional athletes in a variety of athletic disciplines. 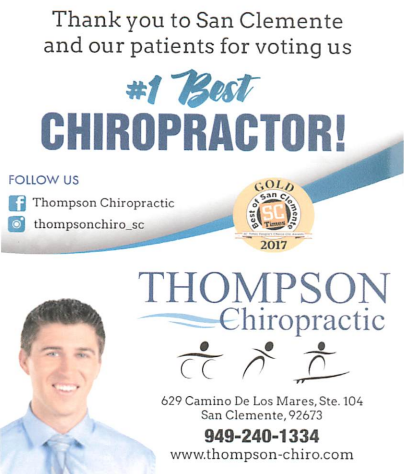 While sports, improving sports performance, and injury prevention were interests that brought me to be a chiropractor, family practice is where my passion is. My goal as a chiropractor is to get you back to the things you love. Whenever we are in pain we are not performing at our optimal level. Pain prevents us from doing things we enjoy. By using the knowledge I gained focusing on athletic performance I am able to improve your performance by reducing your pain as fast as possible and maintaining the proper structure and function of your spine. I continue to stay active by participating in triathlons, playing basketball, surfing, and running after my four boys. My wife, Catherine, and I live here in San Clemente with our four boys; Ian, Caleb, Declan, and Troy.